The composition is your complete performance. It's how you've arranged your content and your layers, the effects you've applied and how you've set everything up to be automated. Think of your composition as your stage. It's where you arrange where everything goes and how everything looks. Your composition composites all your layers together, applies the final effects and then sends it to your screen. If you're an advanced user, you can use the Advanced Output to further cut up and warp your composition. Or you can send the end result to other applications via Spout or Syphon, to further process it. Via Composition > Settings, you can change a few important details of your masterpiece. This is how you will recognise this composition. It's also the filename Resolume will use to save it to disk. "You have strength. You shall be known as Usul, which is the strength of the base of the pillar. This is your secret name in our troop, but you must choose the name of manhood, which we will call you openly." Here you can jot down some notes about this composition, which will be saved as metadata. The resolution that your masterpiece will render at. Via the dropdown, you can select from a list of common resolutions, the resolutions of currently connected monitors, or you can type in a custom resolution directly. This will limit Resolume's fps to a fixed maximum. On auto, Resolume will sync to your monitor's refresh rate. 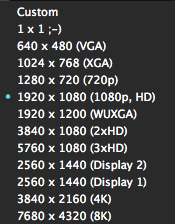 So if your monitor is set to 60Hz, Resolume will render at 60 fps. Rendering more would be silly, because your monitor won't be able to display those frames, and they would be thrown away. This is the setting that you'll want to use for the majority of the time. When you're pushing very high resolutions or when using lots of effects, it can be that your computer can't keep up with what's going on. In those cases, Resolume will try to keep things at 60fps, but it will start dipping. Depending on how hard you're pushing things, your fps can start fluctuating between 40 fps and 60 fps. In those cases, it can be smart to limit your framerate to 30fps. That way, every frame takes exactly the same time to render. This way, playback will be perceivably smoother. Also, effects like strobes will be equally divided between on and off, instead of stuttering because they're strobing at 43 fps at one moment and 57 fps the next. Tip! For super smoooooth playback, you'll want to match the framerate of your composition to the framerate of your content. 25 fps clips will play silky smooth when the comp is set to 25 as well. Note! When your computer cannot keep up and is rendering at 23 fps, putting this setting at 60 does not give it magical powers. It will still have to do the same amount of work on the same hardware, so it will struggle just as much as before. This will let you switch between 8 bits per channel and 16 bits per channel rendering. This will give you higher color fidelity when doing complex composites or applying intricate effect chains. Tip! With great power comes great responsibility! This is not a magical switch that makes everything look better. When set to render at 16 bpc, your computer will need to work considerably harder. If your whole production workflow is not 16 bpc, you are not likely to see an immediate difference. In the top left of the interface, you will find a few powerful controls. The Composition button will let you preview the composition, even when it's faded down. The X button will let you eject all playing content in one click. The B button bypasses the entire output, while the M slider gives you the same control under a fader. Tip! Because the M slider controls the visibility of everything going out of Resolume, it will show red when not set to 100%. The S slider controls the speed of all playing clips at the same time. Note that the global speed control has no effect on BPM-synced clips, as those are controlled by the master BPM clock instead. The two arrow icons will let you trigger the previous and next columns. Yay! Here you can control the master opacity of the composition and the speed of all playing clips at the same time. These controls are linked to the ones above. 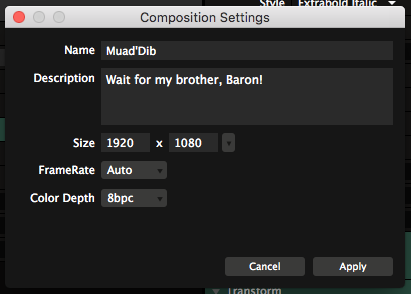 In the composition panel, you have finer control because you can both set and see the values numerically. Gives you control over the master volume and pan. Fade out the video, independent from the audio. 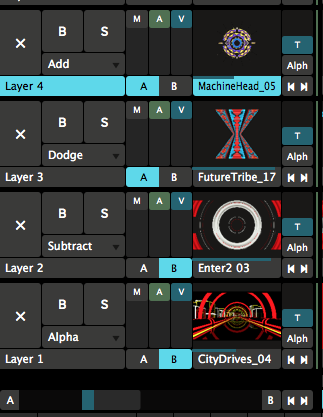 The crossfader will let you assign layers and groups to a 'bus', and then fade between buses. This way, you can put layers that look good together on either side of the crossfader, and mix between them quickly using a single slider. You assign layers to a bus, by toggling the A or B buttons to the right of the layer's name. Resolume will then composite those layers together first. When the crossfader is all the way to the left, it will only show the layers on the A bus. When it's on the right, it will show the layers on the B bus. When it's somewhere in the middle, it will blend the two buses together. In the composition panel, a few options can be set for the Crossfader. This determines what blend Resolume will use to composite the buses together. You can choose one of the many blends that are available. This determines what happens when you press the A and B buttons to the left and right of the crossfader itself. Jump will make the crossfader go to that side immediately. Jump & Return will do the same as Jump. When it's clicked again, it will return to the previous side. Cut is like Jump & Return set to 'piano', meaning it will return to the previous side when released. Fade (Legacy) will do a slow fade to the clicked bus over 4 beats. This sets a different mixer curve, changing the responsiveness of the crossfader. For the crossfader to work properly, you'll want to have all bused layers right after one another in the stack. The Crossfader is an actual mix. It renders all the layers assigned to buses first. This result is then pulled down to the first layer present in the crossfader and rendered down as a single layer in the composition stack. So when you're combining layers assigned to the crossfader with layers not assigned to the crossfader, you might get unexpected results. Things get especially weird when unassigned layers are in between assigned layers. With the global direction controls, you can quickly change the direction for all the clips that are currently playing. You can switch the direction between forwards or backwards, as well as set them all to random mode. Tip! By right-clicking the button you can 'pin' the direction controls. That way, every clip you trigger will automatically be set to this play mode. So when you right-click the R button, it becomes pinned, and every clip you trigger will be set to random playback, regardless of how it was set before. You can find the global speed and direction controls by choosing View > Show Layer Transport Controls, they then appear in the top left of the interface. These are essentially the same as the trigger options for the clip. Except here you can set them for all the clips in this composition. You can imagine this saves a lot of time on having to set these for every clip individually. Of course, these setting can then again be overridden by individual clips.